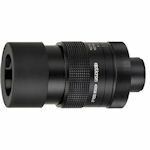 Opticron offers zoom eyepieces that fit their spotting scopes. Since the scope bodies have different focal lengths, magnification varies depending on which scope is used. Opticron Fieldscope Eyepieces include SDL v2 zooms, HDF fixed and zooms, and HR zooms. All these eyepieces vary in magnification depending on the focal length of the scope body to which they are attached.